CenteringPregnancy® is a national program that has a proven record of better birth outcomes for women and their babies. Centering is prenatal care that includes an individual health check up with additional time and attention in a group setting. You will experience your pregnancy with the same health care providers along with other women who are due near the same time as you. Women may choose to have a partner attend the Centering Program with them. Women report that the experience of Centering brings them closer to their health care team and with other women. Pregnancy becomes a very special experience, for a very important life event. Women are enrolled in the CenteringPregnancy Special Care after their first visit with the perinatologist. The frequency of sessions mirrors the traditional visit schedule. In this high risk setting some mothers may need additional individual visits. Women will receive prenatal care, sonograms and testing as usual. They are actively involved in planning their care decisions about many things in their life, including those events that affect glucose control. The goal of Centering is to help women manage their health and the many challenges of a medically complicated pregnancy. 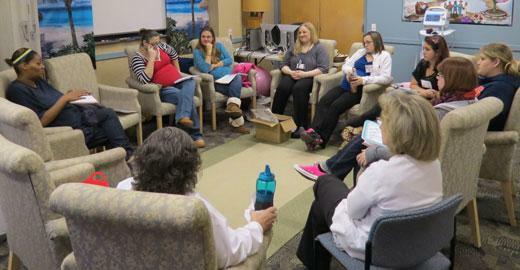 Participants learn about pregnancy and prepare for the birth of their baby. The women in the group are due around the same time and provide support and empowerment to each other as they progress through the journey together. We have seen a very strong bonding occur between women as a result. Educational topics are planned for each session, but the content may also be determined by the need of each woman at the time. Guest speakers provide expertise in lactation, infant safety and neonatal intensive care information, improving knowledge and decreasing fear. Women enjoy healthy snacks and drinks during the Centering session, providing an informal opportunity to take a break and talk with other group members over a soothing cup of tea. Time to get to know other women with diabetes of similar gestation. The group will continue to meet through the post partum follow-up. The reunion is planned and is always such a joyous celebration. Women bring their babies and families and celebrate their experience. The most common word used to describe Centering is fun! Centering is based on the proven principle that when people are actively engaged and involved in a discussion with their peers, rather than being lectured or given a pamphlet, they will have greater understanding and are more likely to change their behavior.